Two elite clubs of the city-Sutlej Club and Club Nirvana-face tax penalty for evading entertainment duty. The excise and taxation department has imposed Rs 15.46 lakh entertainment duty and penalty on the Sutlej Club located near Rakh Bagh, while Club Nirvana, on Hambran Road, will have to shell out Rs 18.21 lakh. Official sources told The Tribune that the duty and penalty was imposed on these clubs for evading tax on the revenues collected during the New Year eve. Congress councillors today staged a dharna against an officer of the municipal corporation, who they alleged had misbehaved with a senior Congress councillor, Hem Raj Aggarwal, over the issue of pending works in his ward. An insecure lover of an Orchestra dancer had allegedly murdered Balbir Singh Kala, driver of the orchestra group, along with an accomplice on June 28 night, fearing he could win over the dancer’s through love. The local industry heaved a sigh of relief as transporters ended their strike today. Goods carriers and truckers began taking orders and also transporting goods today. 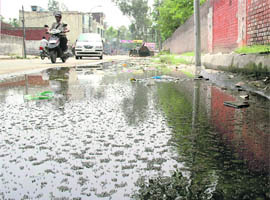 Post heavy rains, puddles formed on roadsides and several localities in city have become perfect breeding grounds for mosquitoes causing dengue and malaria, but the civic body is yet to wake up and start its fogging operations. Upset over inadequate and erratic power supply to agricultural sector, the Bhartiya Kisan Union (BKU) has threatened to gherao the headquarters of the Punjab State Electricity Board (PSEB) at Patiala. A detailed programme for agitation against failure of the PSEB to ensure committed power supply to farmers will be chalked out in the state committee meeting of the union being convened here on July 10. The VHP will observe Shri Amarnath Yatra Raksha Saptah from July 5 to 12 to highlight their demand for allocating the land for the Shri Amarnath shrine. The party in a statement issued here today thanked RSS activists and other religious and social organisations for extending support to their bandh call. A large number of people paid obeisance to Lord Jagannath as the much-awaited “Jagannath yatra” passed from the busy city roads today. 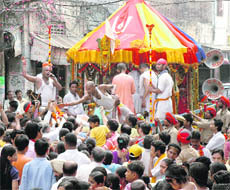 People came from various parts of the city to see the bejewelled “Rath” carrying the idol of Lord Jagannath amidst chanting on mantras and hymns. At least 3,332 women from the district have benefited from the Janani Surakhiya Yojana (JSY), a welfare scheme for expectant mothers falling under the below poverty line (BPL) or other weaker sections of society. About Rs 18, 266,00 had been distributed among the rural women from April 2007 to March 2008. The District Consumer Disputes Redressal Forum has ordered the Punjab State Electricity Board to pay Rs 2,500 in compensation for causing unnecessary harassment to a consumer. 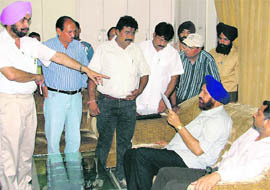 The forum also quashed the demand of Rs 21,473 raised by the board on account of theft of power. Activists of municipal corporation employees sangharsh committee today protested against the suspension of Municipal Town Planner, Amritsar, S.S. Bhatia, in the infamous Gulchaman Gali encroachment case. A team of special Hoshiarpur police arrested Gurdeep Singh, alias Billa of Jhaj police station, Tanda, Hoshiarpur, yesterday. He used to help his Hamburg (Germany)-settled brother, Gurmeet Singh, alias Bagga of Jhaj, leader, Khalistan Zindabad Force, in carrying out his orders and work as a coordinator for carrying out terror activities in India. Guru Angad Dev Veterinary and Animal Sciences University (GADVASU) launched a project in June last year on “Utilization of Inland Saline Waters of South-West Punjab for Aquaculture” under the auspices of the Punjab Farmer’s Commission. Government College for Women (GCW) has raised the college wall to discourage rowdy youth to peep inside the college premises. If all goes by plan, then Kundan Vidya Mandir (KVM) School would soon become the first polythene free school of the city. Bharat Inder Singh Chahal, former media adviser to former Chief Minister Captain Amarinder Singh failed to appear before the Fast Track Court here today in an attempt to murder and land grabbing case. Himani and Victoria from Haryana shared top honours by clinching titles in the girls’ under-12 and under-14 years categories, respectively, of the annual PAU AITA Total Tennis Talent Series Championship. The championship was organised by the Total Tennis Academy, which concluded at the Punjab Agricultural University campus courts here today. 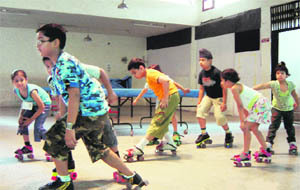 Dr Deepak Prashar and his younger brother, Ravi Prashar,who runs a bodybuilding training centre in Ludhiana, have been selected as coach of the Indian Bodybuilding and Fitness Team and a member of the medical and dope control committee of the Indian Bodybuilding and Fitness Federation, respectively.